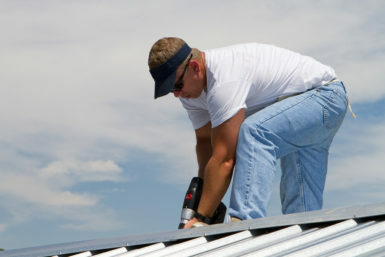 If your home’s roof is past its prime or has been damaged by severe weather, it’s important that you contact reliable roofing contractors that can return it to optimal condition before costly damage is done to your home. In the Troy, Illinois area, the roofing company that homeowners turn to for all of their repair and replacement needs is Daech & Bauer Roofing. We have earned a reputation for providing the highest levels of craftsmanship and integrity, and we have successfully completed more than 10,000 projects and counting. What’s more, our “apples to apples” price guarantee means we will match any local roofing contractors that offer the same products and services for less. When you choose Daech & Bauer, we will ensure that your repair or replacement project results in a roof that will last well into the future. We use products from industry-leading manufacturers like Owens Corning™ and CertainTeed, and we offer a complete roofing system that will allow your roof to resist water intrusion and weather-related blow-offs while providing excellent attic ventilation. This can help prevent moisture buildup and also reduce heat transfer, making it easier for you to keep your home cool in the summer and warm in the winter. And, when we’re done servicing the roof on your Troy, IL home, we will back our work with a five-year standard labor warranty. If you would like to learn more about the factors that have helped us become one of the most trusted roofing contractors in Troy, IL and neighboring communities, contact Daech & Bauer Roofing today.